March 20, 2019 / Jen T.
This is a sponsored conversation written by me on behalf of Cricut. The opinions and text are all mine. Affiliate links are included in this post, which means If you purchase something through the links, I may receive a small commission at no extra charge to you. We’re eleven weeks out from my daughter’s wedding and we’ve been busy, y’all! Every few weeks my bride-to-be, some of the girls in her wedding party, my mom, my daughter’s stepmom and my sister all come over to my house and we craft the day away. We’ve been making all kinds of goodies for the wedding! My house totally looks like a sweat shop with all those girls crafting in here. :) I seriously can’t wait to see how it all comes together on the wedding day! In the middle of all the wedding planning, we’ve also been prepping for her Bridal Shower and a Bridesmaid’s Brunch. So much is happening I don’t even know which end is up. It’s crazy town over here! Anyway, if you know me at all you know that I am all about the personal details. Well, with the help of my Cricut Explore Air 2, Martha Stewart Special Edition (available exclusively at Michaels), we have been personalizing everything, y’all! These personalized napkins were so easy and so cute that I just couldn’t wait to share. My daughter is a huge mimosa lover, and we’ll be having mimosas at both her shower and the brunch. The bubbly will definitely be flowing, so with the help of the Martha machine and the Martha Stewart EasyPress 2, we were able to customize some “Pop the Bubbly” napkins for my girl. Aren’t they so cute?!! Begin by opening this project in Design Space and clicking “Customize.” When the project opens, select the design and click “Detach” in the bottom right corner of the screen. Open a text box and type the names that you’d like to personalize the napkins with. I used the “Babette” font for this. When you type the letters, Design Space spaces them pretty far apart. Decrease the letter space until the letters meet like you’d like them to. Once you have the text how you’d like it, delete the names I have in the project and move your names to that space. Keep the names highlighted, then click “Weld” at the bottom right of the screen. This will ensure that the machine cuts your names out as one full cut instead of cutting out each individual letter. Next, select the entire design and center it horizontally. Keeping the entire design selected, click “Attach” in the bottom right hand corner. This action keeps all of your design in place when you go to cut. At this point, measure the space in your napkin and determine what dimensions your design needs to be. With the entire design selected, use the width and height options in the top bar menu to size your design to fit the napkin space. Quick note: If you’d like to cut more that one decal at a time, simply select your design and click “Duplicate” prior to clicking “Make It.” Design Space will add the additional images to your cutting mat. Load your iron-on material onto a Standard Grip Cutting Mat, shiny side down. Load the mat and click the blinking button to cut. Once the images are all cut, it’s time to weed! Peel away the large pieces of negative vinyl, then use a weeding tool to pull out the vinyl from in between the letters. I love to use my Cricut Bright Pad for weeding! It lights up the cut lines making it soooo much easier to see what needs to be pulled out! Pressing the iron-on is my favorite part! Are you ready?!! Preheat your Martha EasyPress 2 to 315 degrees and set the timer for 30 seconds. You can absolutely use an iron for this if you don’t have an EasyPress, but an EasyPress gives you successful adhesion in less than a minute, and precise temperature control for flawless transfers every time. It’s kind of a guessing game with an iron. Next, protect your work surface. You can use a towel on your countertop, but I prefer the EasyPress Mat. Place the napkin on the mat. Press the EP2 to the napkin for about 5 seconds to preheat the material. Situate the design onto the napkin where you’d like it to be adhered, place the EP2 over the design and apply slight pressure, then push the “C” Cricut button on the EP2. The timer will count down 30 seconds. When the 30 seconds is over, flip the napkin over and press for an additional 15 seconds. Let the napkin cool just a bit, then peel away the carrier sheet. Ta-dahhhhh!!! Look how CUTE that personalized bridal shower napkin is!!! March 04, 2019 / Jen T.
How did we ever survive before post-it notes? I literally have them everywhere in my house reminding me of the gazillion, trillion things that I never can seem to remember on my own. In an effort to get more organized (and maybe save a few hundred trees), I decided to find a way to ditch the paper notes and come up with a better way to keep track of that never-ending “to do” list. Now, I know that I can use my phone or computer to keep reminder lists, but if you’re a visual person like I am, you perform much better if you can actually see the list. When I was picking up some poster board at the Dollar Store last week, I spotted some clipboards on the shelf and a light bulb went off in my head. I had gotten a shipment of fun-colored Martha Stewart paints in the mail a week earlier...what if I used those paints to jazz up the clipboards and used those to keep my lists organized? Cricut carries Chalkboard Vinyl, so I could cut some of that, put it on top of the paint, and have a super cute new DIY Chalkboard to replace all those post-it notes. Y’all! They turned out SO CUTE!!! Get the easy, fun DIY below. February 20, 2019 / Jen T.
I guess I should start this DIY Wooden Farmhouse Sign post by telling you (if you didn’t already know) that our oldest son got married in October. ❤︎ If you follow me on social media, you’ll also know that a few months after he got engaged, our daughter got engaged. Her wedding is coming up in June. Between TWO kiddos getting married within the course of a year, a busy work schedule, and trying to have a life, needless to say it’s been a little hectic around these parts! January 23, 2019 / Jen T.
Do you decorate for Valentine’s Day? I don’t know about you, but when all of the Christmas decorations come down, I feel like the house looks so empty and blah! Adding a little bit of life back into the decor for Valentine’s Day seems to perk things right back up. Embroidery hoop crafts are all the rage right now, so I thought it might be fun to give this trendy craft a Valentine’s Day twist. With just a few materials, I was able to whip this Valentine’s Day Embroidery Hoop craft up in a jiffy, and I’m gonna show you how you can, too! December 05, 2018 / Jen T.
Hey y’all! I’m back again with another project that I created in collaboration with Cricut, Michaels, and Martha Stewart, and I can hardly wait to share this one with you! It’s fast, it’s affordable, and it’s so darn cute!!! I’ll give you the full “how to” for this DIY Stocking Idea below, but I hope you’ll use it as a baseline to get your creative juices flowing. The possibilities are endless here! Obviously, most people personalize stockings to hang in their home, but think outside of the box, too! In this case, I used the stocking as gift wrap. This would also be a great gift for neighbors, Christmas Party hostesses, your boss…heck, anyone really. The point is, don’t be afraid to add your own spin to the personalization (there are a slew of fun options in Design Space), or even the gift inside. It doesn’t have to be wine…it can be anything! November 28, 2018 / Jen T.
November 14, 2018 / Jen T.
I’m super excited to share my latest collaboration with Cricut, Martha Stewart, and Michaels with you because I think you’re gonna love it! If you’re mad for plaid and like to get a little crafty, this Buffalo Check Thanksgiving Table is for you! Sometimes the simplest projects are the coolest, and this 80s-Inspired DIY Table Runner happens to be one of the simplest, coolest projects you’ll ever see! We recently threw a “Bad to the Bone” 80s-Inspired Halloween Party, and this super cute DIY added a ton of flair to the festivities…and it was so easy to make! The great thing about this is that you can use it for any 80s themed party; it doesn’t have to be just for Halloween. Simply leave out the pumpkins and you can use this idea any time of year! If you’ve stepped into a party store lately, you’ve likely seen some version of party crackers. They’re all the rage right now, and they’re so darn festive! For our recent “Bad to the Bone” 80s-Inspired Halloween Party, I created a super easy DIY version of these cuties, and used them to mark the place settings. They turned out so cool! What I really love is that they serve double duty…they act as place cards and they can be used as party favors! Take a peek below for the super easy how-to instructions for making these 80s-Inspired DIY Party Crackers. These 80s-Inspired Favor Buckets are totally rad, dude! We used them for our recent “Bad to the Bone” 80s-Inspired Halloween Party, but these fun little favors can be used any time of the year. Take a peek below for the super easy DIY. September 19, 2018 / Jen T.
What’s black and white, and magical all over? This adorable Unicorn Trick or Treat Bag! September 12, 2018 / Jen T.
Wanna surprise your pals, coworkers, or your kids’ teachers with a fun little Halloween treat? This DIY Halloween Sugar Scrub Gift Idea is sure to do the trick! We all love a little pampering every now and then, so sugar scrub makes a wicked cool Halloween treat. Tint it to look like candy corn, and it’s just boo-tiful! To kick it up a notch and make it even more spooktacular, personalize the jars with a sassy saying. I used my Cricut® Explore Air™ 2 Special Edition, Martha Stewart Machine Bundle to jazz up the jars with some fun personalization. If you’ve been following my blog and have seen my “Mint to Be” Baby Shower or my “She’s a Succa for Him” Succulent Bridal Shower, then you know how obsessed I am with my Martha machine. It can cut over 100 different materials at twice the speed of previous models, and the bundle (which is available exclusively at Michaels) includes twenty-five exclusive Martha Stewart images. 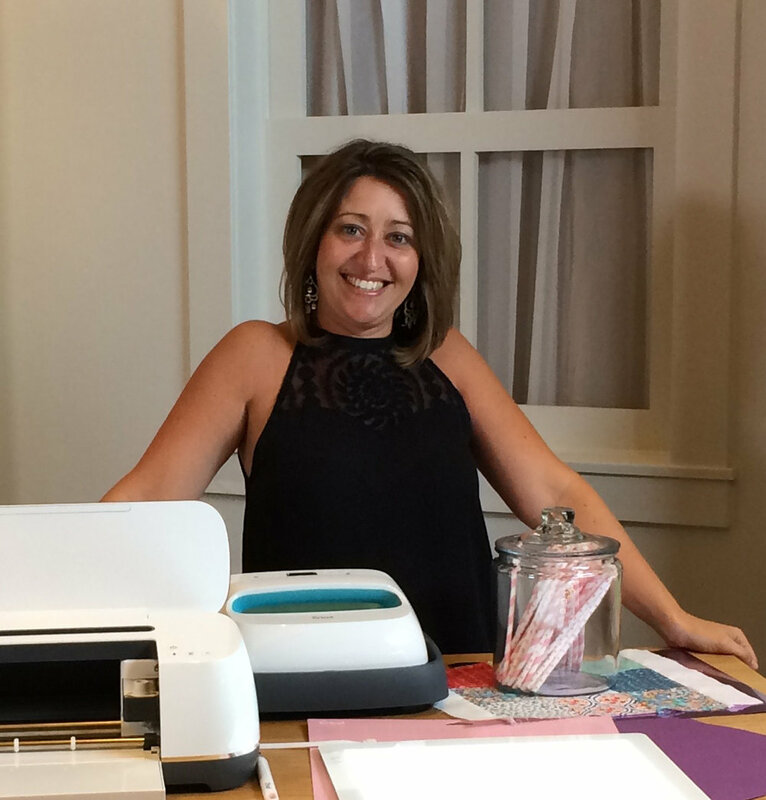 This is in addition to the thousands of ready-made projects and images that are available in Cricut’s Design Space! There is so much fun to be had with this bundle!!! July 11, 2018 / Jen T.
In the spirit of sippin,' today's post is a super cute, summer-inspired project, which just so happens to be the perfect resting spot for your summer sips...DIY Tile Coasters.